The book of Revelation has fascinated and bewildered readers since it was written. Among the scriptures, it is perhaps unrivaled in its use of images, symbols, and prophetic theater. Yet nearly all the images, symbols, and dramatic events in Revelation can be found elsewhere in scripture. Revelation isn’t unique as far as its content goes. It is unique in the way it collects and synthesizes biblical imagery. For instance: Jesus introduces Himself to the church at Philadelphia as, “The Holy One, the True One, the One who has the key of David, who opens and no one will close, and closes and no one opens….” (Rev. 3:7). The “key of David” is a mysterious reference. What is it? The prophetic back story is found in Isaiah 22. Verses 15 through 22 contain a prophesy against Shebna, the steward of David’s palace. Shebna’s pride and self-reliance displease the Lord. God warns that judgment is coming on Shebna, and that he will be removed from his position as steward. “‘On that day,” the prophecy continues, “I will call for my servant Eliakim son of Hilkiah…. I will place the key of the House of David on his shoulder; what he opens no one can close; what he closes, no one can open. I will drive him, like a peg, into a firm place…. They will hang on him the whole burden of his father’s house: the descendants and the offshoots—all the small vessels, from bowls to every kind of jar. On that day’—the declaration of the LORD of Hosts—‘the peg that was driven into a firm place will give way, be cut off, and fall, and the load on it will be destroyed.’ Indeed, the LORD has spoken” (Isaiah 22:20, 22-25). On its face, this prophecy doesn’t seem very positive. Shebna will be replaced by Eliakim, who is God’s man. 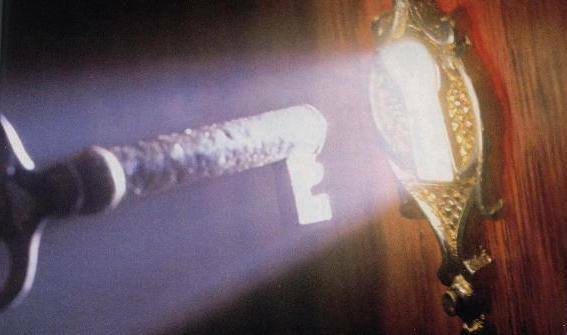 He will hold the key of David and have the power to open or close the house of David. He has authority over the house, its contents, over who comes and goes through its door. Everything in that house will hang on him as on a peg driven into the wall. Yet the Lord says the peg, Eliakim, will give way. Everything hanging on him—the whole house of David—will fall and be cut off with him. How are we better off than we were with Shebna? As bad as all this seems, Eliakim’s name holds the promise of better things. Eliakim means, “God raises” or “God sets up.” Though Eliakim falls, God raises him; though he’s cut off, God sets him up. As the Son of David, Jesus was called by God to bear the burden of David’s house. Everything concerning God’s promises to David and his kingdom, Israel, hung on Jesus. He was the peg driven in a firm place. At the cross, Jesus gave way and was cut off. David’s house fell. Along with it fell messianic purpose: to draw all nations into God’s kingdom. But God raised Jesus. He set up David’s house anew. In Christ He revived the messianic imperative, expressed in Matthew 28—“All authority has been given to Me in heaven and on earth. Go, therefore, and make disciples of all nations, baptizing them in the name of the Father and of the Son and of the Holy Spirit, teaching them to observe everything I have commanded you” (Matt. 28:18-20). Jesus holds the key of David because He died and rose again. When He opens, no one shuts. When He shuts, no one opens. He is Master of God’s House. He has charge over everything in it, over all its comings and goings. “I am the door. If anyone enters by Me, he will be saved and will come in and go out and find pasture” (John 10:9).